For the second month in a row, Taking Time and Keeping Time by Wendy Sparrow top our bestsellers! Take a peek below to learn more about those books and see what else was popular to start the year. When Ruin’s mortal sacrifice to the Fates on New Year’s Eve is already dying, it should be the easiest life he has to take, but not this year. The dying man knows Ruin is there to kill him, but he asks Father Time’s son to look after his twin sister. Ruin can’t stay away from the sweet and sensual Phoebe. His previous interactions with women changed the definition of his name, Ruin, so he can’t fall for her, especially when the lovely mortal doesn’t know he killed her brother. Phoebe’s brother promised to send her a guardian angel, but Ruin seems too devilish to be holy. He only wants to be friends and keep watch over her, but she can’t resist him. Loving Ruin is a sin tempting her heart. How wrong is it to cause an angel’s fall? Ruin and Phoebe’s time is running out as another New Year’s Eve sacrifice approaches, and Ruin might lose everything for keeping his true hand in fate secret. The first of a trio of trilogies by three amazing romance writers. 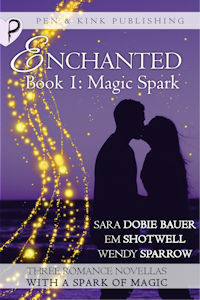 These stories all have two things in common: magic and an unconventional romance! Spitfire, New Orleans weather girl, Cheyanne Murphey has everything, and that is exactly how she likes it. When she discovers evidence of her fiancé’s philandering, she refuses to let her perfectly cultivated image fall to pieces. Cheyanne has worked too hard, dragging herself up from the trailer park into New Orleans’ society, to give in without a fight…even if that means trading a year of her life in exchange for a love incantation from her ancestor’s spell book. A skyclad, moonlit dance, a mysterious potion, and magic gone awry leave Cheyanne with a very peculiar life lesson: love can take on many forms, so be careful what you wish for.